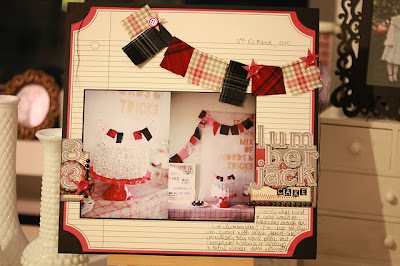 jbs inspiration: Happy Lumberjack Birthday Shimelle!!! 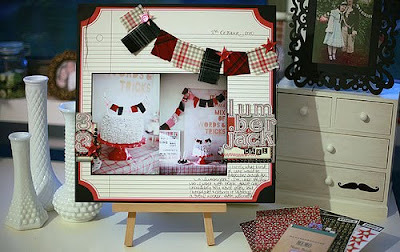 I love all the red and black goodness in Jenni's collections! 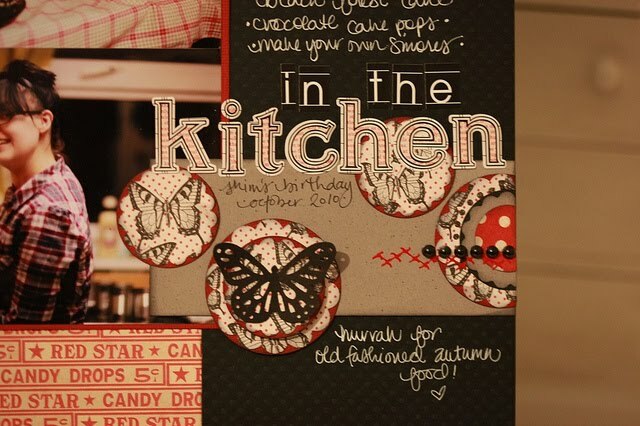 I started with black dotted swiss cardstock, then piled on the red and black papers, including some in the full sheet size and others in the mini papers, so the full butterfly design can be seen even when punched into various circles. For the title, I mixed the chalkboard and bookprint letter stickers. 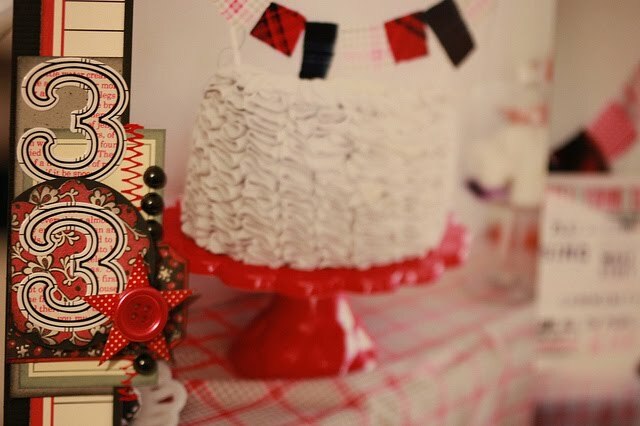 The accents are stacks of punched circles - some plain and others scalloped, all edged with black ink, then some are topped with red stitched rub-ons and black pearls. 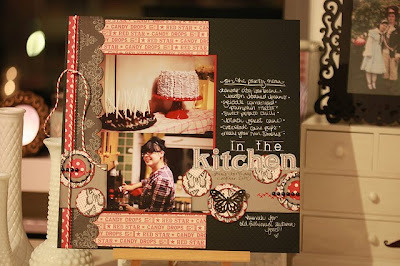 The black circle border at the left is a JBS rub-on added over the spot where the two border strips meet. 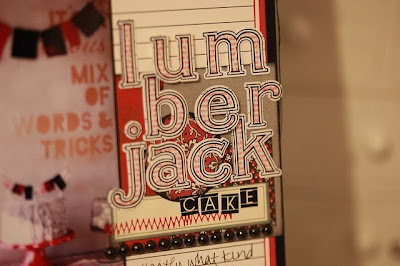 For my birthday, we hosted a lumberjack-themed evening, which was a laugh considering I am pretty girly! I loved raiding my fabric stash to make bunting to decorate, including this smaller version that topped my cake. What kind of cake is masculine enough for a lumberjack? I haven't a clue, so I went with clever wordplay instead and served...black forest cake! 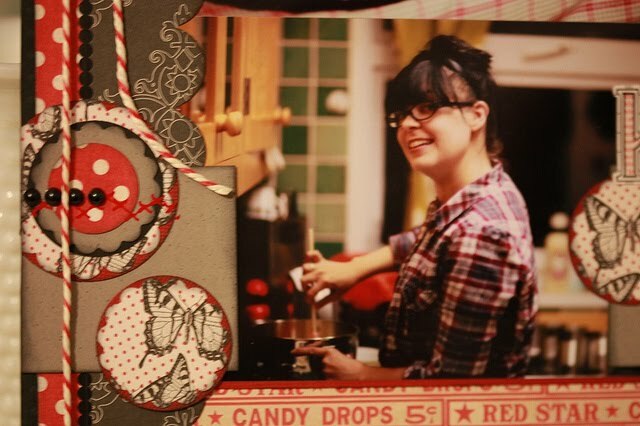 The background here is a die cut paper from JBS, cut down just 1/4" on each side to show the black border of the cardstock. JBS products include the large letter stickers in a black outline with red print, the mini papers in red and black, stickers from the grey memo book, red pear buttons and red star stickers. The smaller letters are the mini chalkboard letters - love these! The red stitches are rub-ons by Hambly Studios. 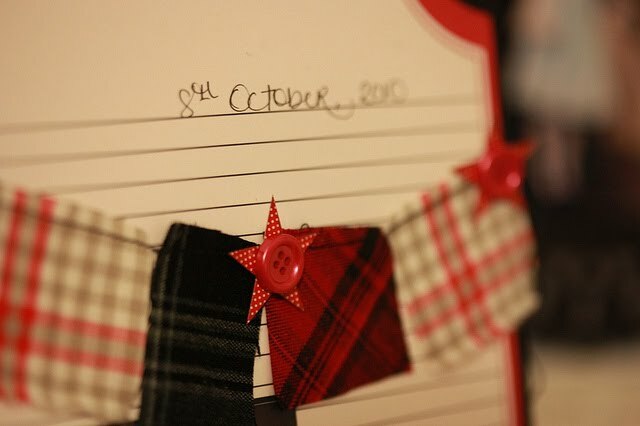 The red star stickers have a button on top instead of a letter sticker and bring a little JBS to the bunting so it matches with the rest of the page. P.S. Shimelle also has an awesome online class focusing on journaling starting this month. You can read more about it on her blog. Both of these layout are absolutely STUNNING! Happy birthday Shimelle! Loved your layouts!